The Jalview YouTube channel started just over 4 years ago with the aim of helping our users to more easily learn to use Jalview. To date, we have published 36 videos, which are organised into playlists that cover 8 key Jalview themes. The videos have proved very popular, and we were very proud to see that this week the 50,000 views landmark was reached! Jalview’s YouTube channel has been watched by people from 146 countries, ranging from Afghanistan to Zimbabwe. Importantly, 84 of these countries are listed as Low or Middle Income Countries (LMICs) by the Organisation for Economic Co-operation and Development (OECD). 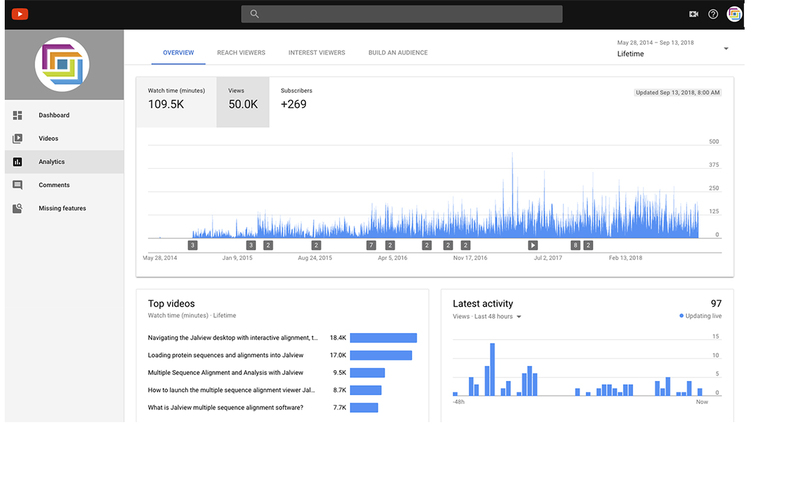 With several exciting new features currently in development, we will be adding new videos in the coming months, and are looking forward to the next 50k views.